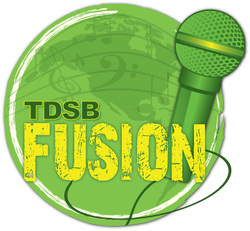 The One World Studio hosted the inaugural TDSB Fusion, with all student participants rehearsing, audio recording themselves, and being video recorded in the One World Studio. Mr. Lashbrook, OWYAP founder and coordinator, was a committee member of the TDSB Fusion initiative. Below are the video entries for the One World Youth Arts Project Day School and Night School students, both teams were finalists and performed at the Toronto Centre for the Performing Arts. Continuing Education Students Rock the Joint! Music and dance performances filled the stage of the George Weston Recital Hall, Toronto Centre for The Arts, on the evening of March 22, 2012. Playing to a jam-packed hall filled with students, parents and Board teachers and staff, finalists from 10 TDSB schools competed in TDSB Fusion Showcase. This is the first TDSB showcase event highlighting student excellence in music, dance, creativity and team work. One of the top 10 finalists was a band from Georges Vanier Secondary school - Continuing Education Program(night school) called Keefer Jam. Their lead vocalist/guitarist Ria Rayappan was amazing at engaging the crowd and the whole rock performance was a definite crowd pleaser. The Continuing Education department is delighted to be working with staff at Georges Vanier's One World Youth Arts project to offer evening credit classes in their state-of-the-art studio. Congratulations to Ria and her classmates Kevin Courtney, Walter Mangru, Jeremy Navasca and their teacher/coach Mr. E. Lewis [One World Youth Arts Project Past Intern and Current OWYAP Night School Teacher] for their amazing performance and their unique rock sound. The judges were extremely complimentary and indicated that this was a Band "with a future"! Go Con Ed students - you rock!! !